In July, Horizons at the University of Mississippi completed its inaugural summer providing academics, enrichment and recreation to underserved students from Bramlett Elementary. Horizons aims to eliminate summer learning loss, positively impact student perceptions of school and learning, and increase student self-confidence through academics, enrichment, and recreation. For six-weeks Horizons at the University of Mississippi hosted 29 rising first and second grade students in a full day summer learning program. Students participated in project-based academics as well as a variety of enrichment activities including art, music, mindfulness, and journalism activities. 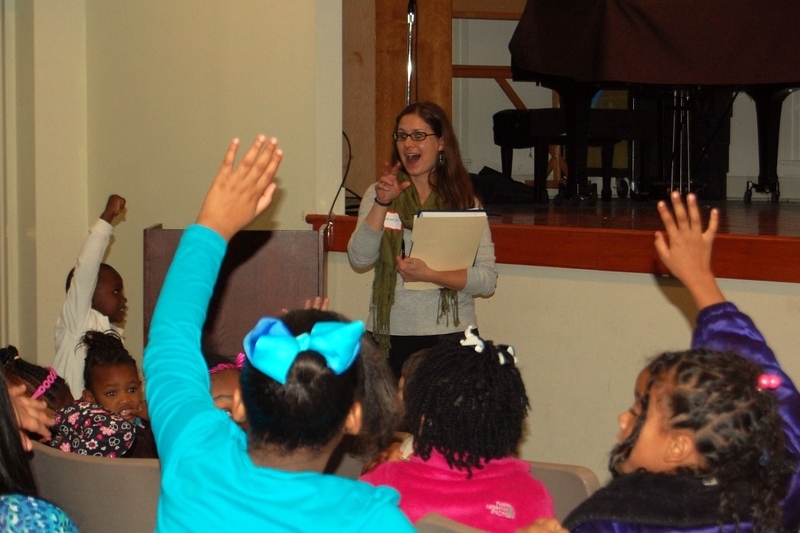 Experienced teachers, a reading specialist and teaching assistants, along with several volunteers from the university’s School of Education and College Corps programs, worked with students in the classrooms. Students also took daily swimming lessons and each student left the program with increased confidence in the water. 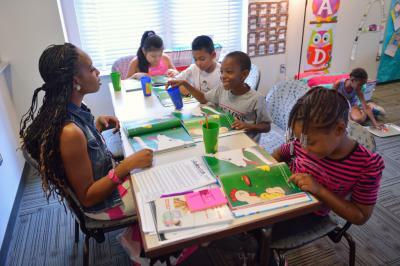 First grade teacher Raven King helps Horizons summer program students with their reading skills. Horizons at UM serves 31 1st- and 2nd-graders by providing summer learning opportunities with support from the McLean Institute. The successful pilot led Horizons at the University of Mississippi to hire Emma Tkachuck as the program’s Executive Director. “Summer 2013 was a huge success and, with the help of campus and community partners, we hope to build on that success in the coming summers, as well as throughout the school year,” says Tkachuck. Because Horizons seeks to retain students for nine summers, family engagement is an important piece of the Horizons model. Not only does the program want to retain the students and families, it also hopes to improve parent engagement through year-round educational workshops and activities. Horizons director Emma Tkachuck introduces herself to students at Family Night. To this end, in November Horizons at University of Mississippi held the first Horizons Family Night at the Lafayette County-Oxford Regional Library. Most of the Horizons families attended, along with the teachers and reading specialist from the summer program. The evening provided students the opportunity to reunite with their summer classmates and watch a storyteller performance. Parents were able to provide feedback about the summer and suggest improvements for the school year and coming summer. Each student took a book home to continue building their home library. A special thanks to the Lafayette County-Oxford Regional Library and the Lafayette County Literacy Council for their support of the Horizons Family Night. Horizons at University of Mississippi is fortunate to have partnered with the United Way of Oxford-Lafayette County, and was recently awarded a $10,000 Responding to Needs grant from the United Way of Oxford-Lafayette County. The current grant will allow Horizons at the UM to expand by adding a new kindergarten class, serving kindergarten through 2nd grade in 2014. Horizons at UM plans to continue this growth each summer until it serves kindergarten through 8th grade. The grant will allow Horizons to focus additional efforts on family engagement and student learning activities throughout the school year. With the grant monies, Horizons will also have the opportunity to focus on increasing the variety and impact of the enrichment activities. Students will be exposed to food education, nutrition, biology and geography in the coming summer. Horizons looks forward to working with a multitude of community partners to provide the best summer learning program possible.